When Portsmouth invests in its own infrastructure, rather than leasing lines from the incumbent providers, consultants estimate they will reduce costs by approximately $421,000 over the five-year period by eliminating leased lines for connectivity. The city may also save another $104,000 per year by switching to VoIP services. Consultants who drafted the Fiber Master Plan estimated that the network, built over a five-year period, will pay for itself in ten years. We reported on Virginia Beach back in 2016, when they were making a similar investment to Portsmouth's current project. Virginia Beach's Internet access needs were increasing and so were their rates. When they decided it was time to invest in publicly owned fiber optic infrastructure, they saved approximately $500,000 per year. As in the case of Portsmouth, savings are important, but so is predictability. With rates rising steadily, it’s difficult for municipalities and school districts to budget for the future. When an entity controls their access to infrastructure because they own it, the positive effects of financial certainty improve their ability to budget correctly in all areas. The Portsmouth initiative is the city’s contribution to a wider regional effort that includes nearby communities considered part of the Hampton Roads metropolitan area. 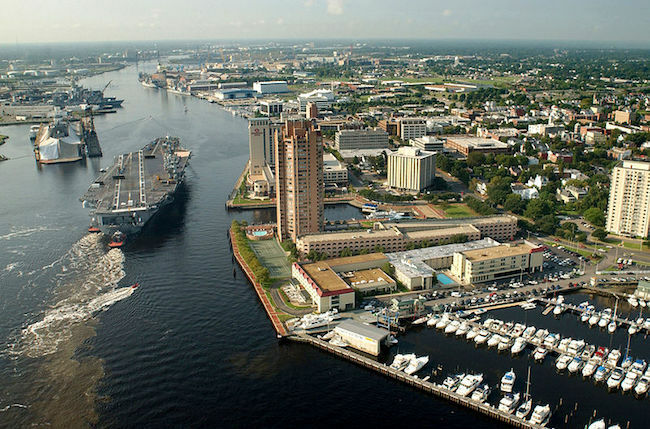 Other cities include Virginia Beach, Norfolk, Chesapeake, Suffolk, and others, These five main municipalities are heading the effort to develop an integrated network to connect employment areas throughout the region. Hampton Roads Planning District Commission has been working to seek funding and support for the Hampton Roads Regional Broadband Initiative. The initiative will take advantage of the MAREA trans-Atlantic cable that connects Virginia Beach with Bilbao Spain and a second cable planned to connect Virginia Beach with Rio De Janeiro, Brazil. Economic development professionals and community leaders in the region want to capitalize on the investment for economic development by attracting high-tech firms to each of the cities in Hampton Roads. In addition to Virginia Beach, Suffolk also owns a fiber Institutional Network (I-Net). While neither networks offer services to the general public, the asset could some day be used to lease excess capacity to ISPs who may want to offer services to businesses or residents. In Suffolk, municipal facilities offer public Wi-Fi. Even though cities in Hampton Roads don’t have plans to offer fiber connectivity to local businesses directly, they accept that the presence of fiber is critical for future economic development. As part of their Fiber Master Plan, Portsmouth will consider making the infrastructure available for wholesale lease agreements with commercial providers.